MONTCLAIR, Calif., December 1, 2018	(Newswire.com) - AMPAC USA, a well-known manufacturer of water treatment systems in the world provides a long line of residential, commercial and industrial water treatment solutions. An experienced company in the field for 28 years, AMPAC produces products with design intricacies, even customized to fit the client requirements. As one starts preparing for Christmas celebration, the company is now adding happiness to it! 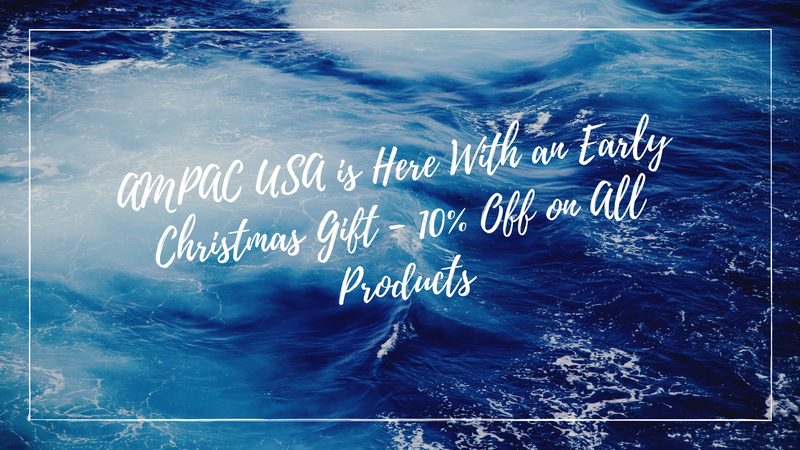 AMPAC USA will be offering a whopping 10% discount on all of its products ranging from filters to systems, accessories, chemicals, plant setups and more as an early Christmas surprise. “A Merry Christmas to everyone! This holiday season we are keeping the spirits up for Christmas and are offering 10 percent off on all our products. Now you can choose any product of your liking and quickly grab it at the best rates. The offer stands for all our current and potential clients alike! They can get a water filter for their home or an RO system for their businesses at discounted prices” says CEO of Ampac USA, Sammy Farag. The sale is especially for people who have been hesitant in making a decision on the water treatment solutions AMPAC provides. In the Winter season, they would be able to make a quick decision on not one but more products to grab. These products come with an unbelievable offer price at a time when people began making a list of gifts to give as a Christmas present. Some of the products that are now open to the sale are whole house water systems, seawater reverse osmosis watermakers, water store equipment, mobile water treatment products and more. Industrial and commercial grade reverse osmosis systems have seen a hike in the past few years. Industries everywhere require water treatment systems for process cleaning, wastewater treatment or even for production purposes. But being large industries, a huge investment also means a huge risk. We always strive for innovations in the water treatment industry so as to be able to provide customers with exactly what they need. The challenge always keeps us on toes and come up with a better product. AMPAC USA understands the risk and therefore makes its line of industrial products with utmost care. The company has an intensive, detailed process through which they are able to manufacture international grade RO systems. Their products are used in Dairy brands, Beer microbreweries, beverage companies, and chocolate factories to name a few. They also have products to offer for the U.S. military. All these come with special attention and customization. “We understand every company and every client is different, which is why our team of skilled and experienced personnel first gather information regarding what you need. The team then proceeds to design a solution that is tailor-made for your particular requirements. This is in my opinion what makes us different. Our industrial RO systems for any two clients are rarely the same,” says Farag. Same or not, the company is surely gaining momentum in the Reverse Osmosis market. For families especially, this is a great deal. What could be a better Christmas present for a loved one than a water filter to hose down all their water treatment problems? It is a thoughtful gift, a healthy choice and is now available at unbelievable discount prices. They will now get a choice from the Residential RO section where they can choose a product suitable to their supply water quality. This section not only comprises of 3,4,5- stage RO filters but also has Alkaline and UV filters for maximum water security. Their products especially the unconventional ones have always been a hit with the customers. Their Alkaline RO, for instance, comes with quality and Alkaline standards that have given results. People who are extra careful of their health have found astonishing differences in their minds and bodies before and after using the product. And this could, in fact, be a gift for their own families this Christmas. Their biggest sale since Thanksgiving this year, AMPAC has opened its gates to more products this time. But one of its bestsellers still remains the Commercial line of RO. More and more commercial businesses are opting for its line of commercial RO systems. Word on the market is that AMPAC systems are metaphorically flexible and easily fit into businesses enough to be invisible. One need not worry about the operations of a commercial grade reverse osmosis system giving you 1200 Gallons of purified water per day. As long as regular maintenance is done, the set-up remains hidden from your eye and out of the mind while still giving you the best results. A better Christmas investment than any to give a business the boost it needs. “That is true; we have been getting a lot of feedback on our commercial RO systems. It is actually because of that we decided to give our clients and potential customers a chance at trying this range of water purification systems firsthand. The purchase comes at a discounted price without compromise on the quality of course. The warranties and after-sales services stay in place as usual. We hope they like the Christmas present from us!” says a jolly Farag. AMPAC USA is known to provide an excellent after sales service. Experts are available 24x7, even on Christmas to answer calls regarding unprecedented downtimes, so their customers do not lose valuable time with their families this Christmas season. Their team is skilled and well trained to make replacements, adjustments and repair the systems manufactured at their facility. This service is applicable to every product offered by the company even the accessories. Users can now enjoy browsing their extensive line of water purification products at a discounted rate of 10%. More details regarding the same will be soon uploaded on the AMPAC USA blog or Social media handles. In case of any queries, you can always reach to their customer support through their website.